Afzal is Muhammad Afzal Guru. Early in the morning on 9 February, the Indian state secretly hanged him. Accused of the attack on the Indian Parliament in 2001, he was denied a fair trial and a mercy petition filed by his wife in 2006 was rejected this January. Afzal languished in a small solitary cell in Delhi’s highly fortified Tihar jail for 12 years until his ‘judicial murder’. The Indian government, in an attempt to hide the fact that they had committed a gross violation of the family’s human rights by keeping them in the dark, offered them the opportunity to say prayers at his burial site. However, this would only be permitted if a ‘proper request’ from the family comes via a letter signed by Afzal’s wife, along with a ‘probate form’ attached to prove her relationship to him. His wife turned down the offer, demanding that the mortal remains of her husband be returned to her. ‘We don’t want him buried in the land that doesn’t belong to us,’ she explained. Analysts who observed the police investigations and court case against Afzal say that there was no concrete evidence against him. India’s Apex Court noted the evidence was only ‘circumstantial’, but went on to announce capital punishment to ‘satisfy the collective conscience of society’. The decision to hang a man on the basis of circumstantial evidence is unparalleled. If the world’s largest democracy can send such a message, then there is a need to reframe the idea of a democracy. Writer Arundhati Roy comments, ‘The hanging of Afzal Guru is a stain on India’s democracy.’ Over 200 academics, writers and filmmakers have written to the Indian President expressing their anguish and outrage. The decision of the court is seen as a well thought-out strategy motivated by party politics: the ruling Congress-led coalition outsmarting the opposition ahead of elections. Afzal and three others were arrested by the notorious special cell of the Delhi police, two days after the attack on the Indian Parliament on 13 December 2001. Three of the four, including Afzal, were sentenced to death. But a higher court overturned the verdict. Although the apex court upheld the acquittal, in 2005, it gave Afzal three life sentences and a double death sentence based on ‘circumstantial evidence’. In various parts of India, Kashmir youth and others protested against the hanging. A placard from a protest in South India read: ‘Dear Kashmiris, we Tamils stand with you. Down with Indian hegemony.’ In Delhi, rightwing Hindu organizations assaulted Kashmir youngsters as they protested and police detained 21 of them. Kashmir students were also detained in Dehra Dun in India’s north. In Kashmir, the Indian state is using its ‘normal’ repression and control tactics, including strict curfew, a news blackout, and more soldiers on the streets, firing at unarmed protesters and even bystanders. Teargas, pepper guns and bullets are being used to quell the protests. Basic necessities such as milk, bread and medicines are inaccessible. Three youths, one just 12 years old, have died. Among the hundreds injured is a young boy who lost his eye. Leaders of resistance groups were either arrested or given house-arrest before Afzal was hanged. The government has given absurd directives to doctors, already working under extreme pressure during the curfew. They have been told ‘that nobody should die’ and ‘not to declare anybody dead if they succumb’. The dead are, instead, to be put on ventilators, even though the doctors argue that this is ‘ethically wrong’. Despite a stringent curfew, the people of Kashmir reserved an empty grave for Afzal next to the grave of resistance leader Maqbool Bhat in the Martyrs’ graveyard. Maqbool Bhat was hanged in 1984 in the same jail as Afzal. Afzal’s epitaph reads: ‘…whose mortal remains are lying in the custody of the Government of India. The nation is awaiting its return.’ The tombstone, raised as a memorial, a symbolic protest and a reminder to the Indian state, was removed by the police and smashed to pieces. Owing to the public outcry, another epitaph was mysteriously put back. 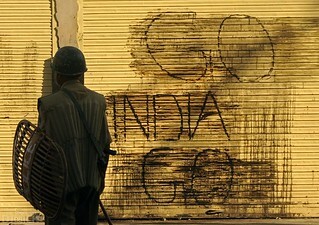 Photo of anti-India graffiti in Kashmir by Kashmir Global under a CC Licence.